Gold & Cranberry Honeycomb Cast Iron Tea Pot, 20 oz. Home | Holiday-Sale | Gold & Cranberry Honeycomb Cast Iron Tea Pot, 20 oz. 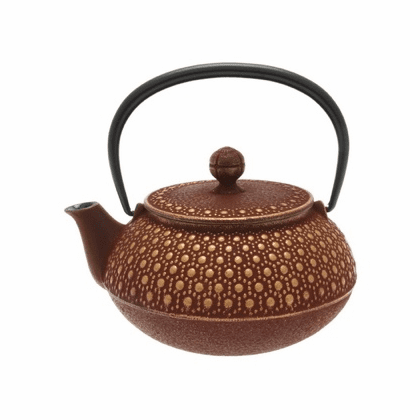 Home | Japanese Cast Iron Products | Iwachu Cast Iron Products Made in Japan | Honeycomb Cast Iron Teapot Series | Gold & Cranberry Honeycomb Cast Iron Tea Pot, 20 oz. It is a beautiful gold and cranberry honeycomb design. Has a stainless steel infuser basket and baked porcelain enamel inside. Holds 20 ounces and is 5-1/2" in diameter.